Excellencies, Secretary Sebelius, distinguished guests, ladies and gentlemen, welcome to the Embassy of Italy. Today we celebrate Italy’s National Day and the 66th anniversary of the Republic: it is always a joyful and meaningful event. However, this year the celebration is tinged with a more somber note. You may have noted, as you entered the premises of the Chancery, that our flags are flying at half mast. A strong earthquake struck the Emilia-Romagna and nearby regions on May 20th and then again on May 29th, with many aftershocks. It brought loss of life, injuries and extensive damage. The Italian Government decided to observe today as a National day of Remembrance, dedicated to the victims of the earthquake and to show consideration of the thousands left in distress and homeless (May I ask you to join me in a moment of silence….thank you). 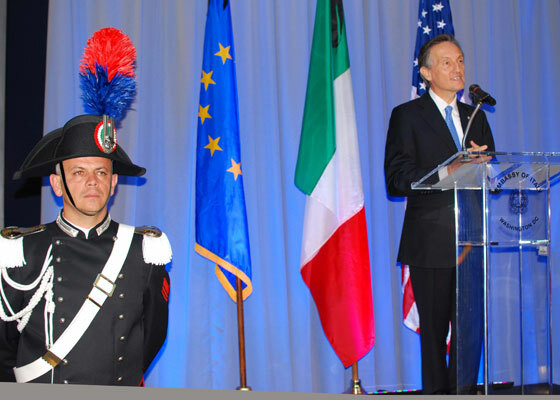 The US government and all the people of this great country have shown once again, even in this moment, how deep is the friendship between the United States and Italy. A friendship that is based on our regard for the values of freedom, liberty, family and human dignity.A friendship that is nurtured on a daily basis by the depth of our political and economic cooperation and by the millions of visitors traveling between Italy and the United States.A friendship that is well represented by your presence here for our National Day. Let me underscore that this particular event has been in the planning for months. Our idea was to present you with a showcase of Italian excellence: design, technology, fashion and obviously food and wine. Our original plans have now been understandably curtailed, as it is only appropriate. Nevertheless, as Giorgio Napolitano, President of the Italian Republic stated: “We will celebrate our National Day, somberly, and dedicate it to the memory of the victims, the suffering of the families, and to the moments of discouragement that we must move beyond. We will celebrate, because the Republic must confirm its vitality, its strong democracy, its serenity, and the resolve with which it meets its challenges”. This is the message from our President. The Republic of Italy stands tall today – though its beauties and its people have been dealt a severe blow. These beauties and this people are what this Embassy proudly represents. And we are glad that you have come and now stand with us, beside us, to both celebrate and commemorate. We look forward to seeing you here again next year. Thank you for your attention. Grazie.